Greetings, and welcome to our first Woodhaven History Digest. If you are receiving this, it's because you signed one of our sign-in sheets at a meeting. We'll prepare this digest periodically to bring you the latest Woodhaven History news - the latest articles, the latest events, the latest breaking news. The digest will contain info not posted yet in other forms of social media. Note: If you do NOT want to receive this email in the future, please reply and let us know and we will remove you from the list. If you've made it this far, congratulations! Stick around! We've got a lot of good Woodhaven Culture and Historical stuff to share! We're starting off with some Big Breaking News! Forest Park Memorial Drive - Breaking! Councilmember Elizabeth Crowley submitted a request by the Woodhaven Cultural & Historical Society (WCHS) and American Legion Post 118 that Forest Park Drive be rededicated as Forest Park Memorial Drive. And now, a street sign will go up on Forest Park Drive (now co-named Forest Park Memorial Drive) during a ceremony on Saturday, May 20th starting at 12 Noon. It was nearly 100 years ago these young men were honored by our community, and we'll be coming together again to honor their lives and their sacrifices. Many more details to follow. Many thanks to CM Crowley and everyone else who supported this proposal (click here to read the letters of support for this request). What Are The Forest Park Memorial Trees? 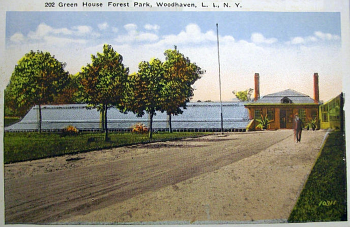 - Two years ago, the Woodhaven Cultural & Historical Society discovered that the trees along Forest Park Drive (near Park Lane South and Forest Parkway) held considerable significance. They were planted in memory of soldiers from Woodhaven killed during WW1. Each year, for Memorial Day, residents would decorate those trees - in fact, they erected a granite monument and plaque and Memorial Day parades used to end among those trees. Click here to watch a brief video explaining how these trees came to be and what happened next. The Amazing Life of George Yoerger - He was a boxing professor, a trick shot artist, a magician, involved in a salacious scandal, embroiled in a case involving a stolen Blue Diamond, a famous dog trainer .... and married into one of Woodhaven's most prestigious families! Click here to read about Professor George Yoerger! The Tough Irish Priest of the 69th - He was a tough Irish kid from Elderts Lane who was decorated 5 times for bravery during World War 2, and sadly lost his life while doing what he was born to do - taking care of others. A Memorial Triangle was dedicated in his name (once forgotten, now rediscovered) and a local football league was named after him! Click here to read about Father Lynch! Keep an eye on this spot as our Library Grows! 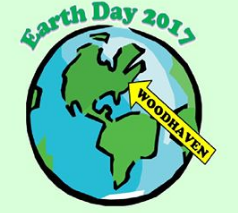 Earth Day at the Woodhaven Cemetery - The WCHS will be celebrating Earth Day at the famous Wyckoff-Snedicker Woodhaven Founders Cemetery behind beautiful All Saint's Episcopal Church (96th Street and 86th Avenue), Saturday April 22nd from 11 a.m. to 2 p.m. Fun for all ages and fun for the whole family - we'll have a stick and twig collection, we'll be planting flowers, planting grass and leaning about composting. Everyone is Welcome! Even if you would just like to walk the cemetery grounds, come out and we'll hook you up with one of our student-volunteers from St. Thomas the Apostle's Woodhaven History Club who will give you a guided tour! Woodhaven Historical Lecture Series - Our next mid-week lecture will take place on Wednesday, April 26th at 1 p.m. at Emanuel United Church of Christ (91st Avenue and Woodhaven Boulevard). WCHS Executive Director Ed Wendell will be giving a lecture looking at Woodhaven from Above and featuring some of the Lost and Found locations in Woodhaven. One of the recently rediscovered gems of Woodhaven is the original Woodhaven Masonic Temple - this is a very interesting story told in pictures! And one of the hidden gems still hidden away somewhere is the original 18th hole for the Forest Park Golf course. We know where it is - we just need to find it!! Richmond Hill Historical Society - The RHHS will be holding their next open meeting at 7 p.m. on Friday, April 28 at the Leonard Center (the corner of 112th Street and 86th Avenue - click here for a map). The guest this month is collector Fred Stern, and he will be speaking about the 1939 and 1964 World's Fairs 1939 and 1964. Next month, the RHHS will meet on a Saturday (May 13th at 1:30 p.m) at the Leonard Center. The guest speaker will be James Greller and he will give a presentation called "Ridgewood/Glendale/Richmond Hill Before the Automobile." Some of you may remember Mr. Greller, he came to the Woodhaven Historical to speak about railroads and trolleys in Queens and he was very well-received! Celebrate Victorian Life - The Friends of Maple Grove Cemetery Present "Victorian Novelties" on Saturday, April 29, 2017 from 12 p.m to 4 p.m. in the Victorian section of the Cemetery, near the gate at Kew Gardens Rd. & Lefferts Blvd. Free Admission/Donations Accepted. Featuring: Denny Daniels and his Museum of Interesting Things, An Exhibit of the Victorians of Maple Grove, Performance by Natalia "The Saw Lady" Paruz on the saw and bells, Victorian Literature Exhibit - B&B Rare Books, Victorian Funerary Practices, Entertainment by Cyclone Jack, Victorian Yo Yo Exhibition, Victorian Musical Entertainment! Click here to see the beautiful flyer! Forest Park Greenhouse Tour - The historic Forest Park Greenhouse will be open to the public on Saturday April 29th, from 9 a.m. to 2 p.m. This is a special event as it is generally only open to the public once every year. Click here to see pictures of the restoration of this greenhouse from back in 2012. Famed Woodhaven Artist Exhibit Opens - Artist Stephen Csoka was born in Hungary in 1897 and moved to the United States in 1934. Today his work can be found in the permanent collection of over 34 museums both in the US and abroad, including the Brooklyn Museum, The Met, The Whitney, and the Library of Congress. Respected in art circles around the globe, Mr. Csoka was also a resident of Woodhaven for almost 30 years, creating many of his pieces from the studio in his home on 87th Street, just north of Jamaica Avenue. A selection of Mr. Csoka’s work, much of it created while he lived in Woodhaven, will be on display at the Shelter Rock Art Gallery in Manhasset, Long Island from April 30th through June 6th. The exhibit kicks off with a reception on Sunday April 30th from 1 to 3 p.m. where you will be able to meet the artist’s son Frank, who was also an art professor at the Fashion Institute of Technology, and was also a longtime resident of Woodhaven. Frank was a guest speaker at teh WCHS last year and gave a terrific presentation (click here for pictures, including a very shocking picture from a dark moment in Woodhaven's History). Bonus: Click here to read our article in last week's Times Newsweekly about Mr. Csoka. 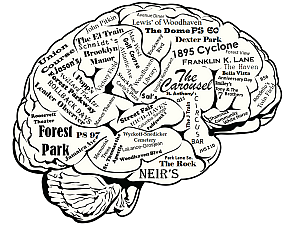 Woodhaven Quiz-O-Rama - Have you got Woodhaven on the brain? Come out to our regular monthly First Tuesday evening meeting, Tuesday May 2nd at 7 p.m. at the Avenue Diner (91-06 Jamaica Avenue). We're doing something special this evening - we're breaking out the game buzzers and we'll be breaking everyone up into teams and giving a presentation loaded with blanks you have to fill and questions you have to answer. The main goal is to have fun! Even though we start at 7, a lot of people arrive earlier to chew and chat - eat dinner while talking Woodhaven History! Woodhaven Historical Party at the Carousel - Save the Date!! Our big event of 2017, our party at the Forest Park Carousel! Friday, June 22nd from 6 p.m. to 8:30 p.m., $10 gets you unlimited rides on our NYC Landmarked Carousel and the Woodhaven Express Train Ride! A great bargain, and all proceeds go to the WCHS - many thanks to the Forest Park Carousel for their generosity! Forest Park Carousel OPENS for 2017 - Speaking of our NYC Landmarked Forest Park Carousel, it is now officially open for 2017 and it looks like they have at least 1 new ride and a few other games and activities to play. Open weekends until Memorial Day when it will be open 7 days a week. Check out this report on NY1. Schmidt's Candies - Did you know that Schmidt's has redesigned their website making it easier to buy online? Check them out here. And remember to stop this precious local legend by stopping in and getting your Easter treats there. Why buy chocolate that's been sitting on a shelf for months at a big chain store when you can get fresh homemade candies in a store that's been in Woodhaven for 90 years? Neir's Tavern and Autism Awareness - Neir's and the WCHS are teaming up to raise money for WORKS Little League's Challenger Division (for special needs kids) in honor of Autism Awareness Month. When you stop into Neir's, you can donate by purchasing one of the special boosters - ask your bartender or server! All proceeds from the boosters will go directly (and locally) to WORKS Little League. Walking Tours in New York - From Green-Wood Cemetery to the old Rock n Roll Clubs of Manhattan to Bay Ridge to Astoria Village, Queens Historian Kevin Walsh walks all over the city looking for the interesting sites to see. Click here to see the 2017 Schedule of Forgotten NY Tours.